Specially designed highly accurate PT100 thermocouple for measuring temperatures of moving machinery. Hard-wearing machined nylon block houses the sensor which is sealed from the harsh environment by a brass compression fitting. 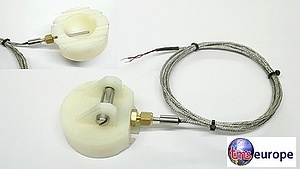 2 mtrs of stainless steel overbraid protects a 2 wire PTFE cable.